Travelling gives you great insight into new places that we've never been before, but it is also continually reaffirming of human kindness and thoughtfulness. There are few places where we haven't felt helped or supported. 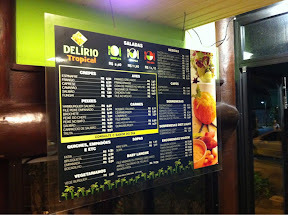 Earlier on our visit to Rio, we stumbled across Delirio Tropical, a restaurant offering an array of healthy, fresh food along a counter - we knew it must be good judging by the queue of locals outside the restaurant. When in a foreign land, judging whether the locals are eating there is a pretty good indicator. Last night we found our way back to the Delirio Tropical. 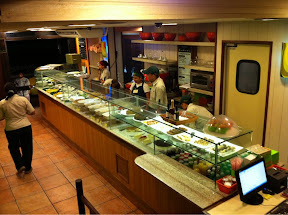 It is always friendly and the counter staff patient in helping to choose food. The manager, Ibram, was present and chose to help personally. English wasn't strong, and so he phoned his English speaking sister and we spoke across the phone. He certainly went the extra mile to give us the service he felt we deserved. 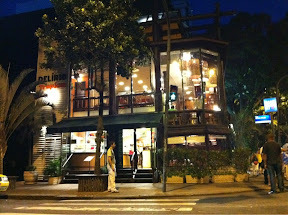 The food is simply amazing and 'delicious' which curiously enough almost directly translates into Portuguese. You won't be disappointed by the array of food on offer here.